Although I’m not there at the moment, I am delighted to hear from neighbors and on facebook that there are a few new businesses in the village. Joe and I have been saying for the past year that our town needs a good wine bar and VOILA now we have one! 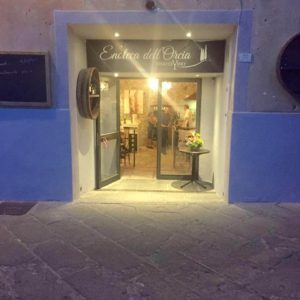 The Enoteca dell”Orcia opened July 16 on the lower end of town (just a short walk from Casa Castigliana) and has a fantastic view over the valley–the perfect spot to enjoy a glass of the local wines. 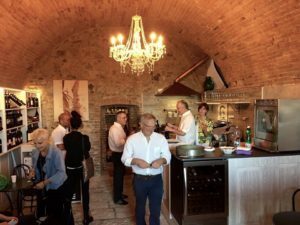 They are serving more than 30 labels of the Orcia DOC wine region and have a nice selection of wines from nearby Montalcino and Montepulciano. You can order a platter of local salumi and formaggi and other local snacks to accompany your glass of wine while admiring the view. I can’t wait to get back there and check it out! Also new in the village is a shop selling locally-made olive oil, honey, jams, pasta and many other food items to be enjoyed during your stay, or taken back to the states as perfect souvenirs of the region. Still new is a laundromat. Although if you are staying at Casa Castigliana we have a washer so you won’t need it, but still it’s great to see some expansion of businesses.